It has been requested that the title of this article be changed to Diabetes . Please see the relevant discussion on the discussion page. The page should not be moved unless the discussion is closed; summarizing the consensus achieved in support of the move. 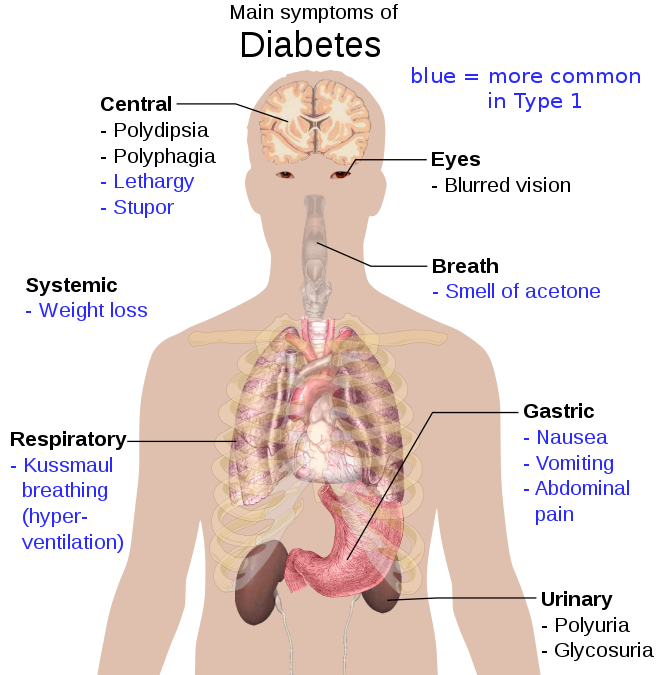 Hyperglycemia, is a condition in which an excessive amount of glucose circulates in the blood plasma. This is generally a blood sugar level higher than 11.1 mmol/l (200 mg/dl), but symptoms may not start to become noticeable until even higher values such as 15–20 mmol/l (~250–300 mg/dl). A subject with a consistent range between ~5.6 and ~7 mmol/l is considered slightly hyperglycemic, while above 7 mmol/l is generally held to have diabetes. For diabetics, glucose levels that are considered to be too hyperglycemic can vary from person to person, mainly due to the person's renal threshold of glucose and overall glucose tolerance. On average however, chronic levels above 10–12 mmol/L can produce noticeable organ damage over time. Frequent urination is the need to urinate more often than usual. Diuretics are medications that will increase urinary frequency. Nocturia is the need of frequent urination at night. The most common cause of urinary frequency for women and children is a urinary tract infection. The most common cause of urinary frequency in older men is an enlarged prostate. Polyuria is excessive or an abnormally large production or passage of urine. Frequent urination is usually an accompanying symptom. Increased production and passage of urine may also be termed diuresis. Polyuria often appears in conjunction with polydipsia, though it is possible to have one without the other, and the latter may be a cause or an effect. Psychogenic polydipsia may lead to polyuria. Polyuria is usually viewed as a symptom or sign of another disorder, but it can be classed as a disorder, at least when its underlying causes are not clear. Polydipsia is excessive thirst or excess drinking. The word derives from the Greek πολυδίψιος (poludípsios) "very thirsty", which is derived from πολύς + δίψα. Polydipsia is a nonspecific symptom in various medical disorders. It also occurs as an abnormal behaviour in some non-human animals, such as in birds. 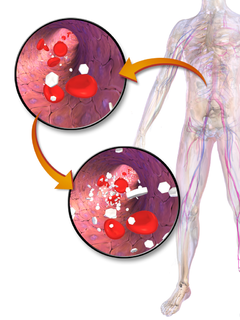 The major long-term complications relate to damage to blood vessels. Diabetes doubles the risk of cardiovascular disease  and about 75% of deaths in diabetics are due to coronary artery disease. Other macrovascular diseases include stroke, and peripheral artery disease. The primary complications of diabetes due to damage in small blood vessels include damage to the eyes, kidneys, and nerves. Damage to the eyes, known as diabetic retinopathy, is caused by damage to the blood vessels in the retina of the eye, and can result in gradual vision loss and eventual blindness. Diabetes also increases the risk of having glaucoma, cataracts, and other eye problems. It is recommended that diabetics visit an eye doctor once a year. Damage to the kidneys, known as diabetic nephropathy, can lead to tissue scarring, urine protein loss, and eventually chronic kidney disease, sometimes requiring dialysis or kidney transplantation. Damage to the nerves of the body, known as diabetic neuropathy, is the most common complication of diabetes. The symptoms can include numbness, tingling, pain, and altered pain sensation, which can lead to damage to the skin. Diabetes-related foot problems (such as diabetic foot ulcers) may occur, and can be difficult to treat, occasionally requiring amputation. Additionally, proximal diabetic neuropathy causes painful muscle atrophy and weakness. Diabetes mellitus is classified into four broad categories: type 1, type 2, gestational diabetes, and "other specific types". The "other specific types" are a collection of a few dozen individual causes. Diabetes is a more variable disease than once thought and people may have combinations of forms. The term "diabetes", without qualification, usually refers to diabetes mellitus. Gestational diabetes mellitus (GDM) resembles type 2 DM in several respects, involving a combination of relatively inadequate insulin secretion and responsiveness. It occurs in about 2–10% of all pregnancies and may improve or disappear after delivery. However, after pregnancy approximately 5–10% of women with GDM are found to have DM, most commonly type 2. GDM is fully treatable, but requires careful medical supervision throughout the pregnancy. Management may include dietary changes, blood glucose monitoring, and in some cases, insulin may be required. Maturity onset diabetes of the young (MODY) is a rare autosomal dominant inherited form of diabetes, due to one of several single-gene mutations causing defects in insulin production. It is significantly less common than the three main types. The name of this disease refers to early hypotheses as to its nature. Being due to a defective gene, this disease varies in age at presentation and in severity according to the specific gene defect; thus there are at least 13 subtypes of MODY. People with MODY often can control it without using insulin. A positive result, in the absence of unequivocal high blood sugar, should be confirmed by a repeat of any of the above methods on a different day. It is preferable to measure a fasting glucose level because of the ease of measurement and the considerable time commitment of formal glucose tolerance testing, which takes two hours to complete and offers no prognostic advantage over the fasting test. According to the current definition, two fasting glucose measurements above 7.0 mmol/l (126 mg/dl) is considered diagnostic for diabetes mellitus. Diabetes mellitus is a chronic disease, for which there is no known cure except in very specific situations. Management concentrates on keeping blood sugar levels as close to normal, without causing low blood sugar. This can usually be accomplished with a healthy diet, exercise, weight loss, and use of appropriate medications (insulin in the case of type 1 diabetes; oral medications, as well as possibly insulin, in type 2 diabetes). The word diabetes ( /ˌdaɪ.əˈbiːtiːz/ or /ˌdaɪ.əˈbiːtɪs/ ) comes from Latin diabētēs, which in turn comes from Ancient Greek διαβήτης (diabētēs), which literally means "a passer through; a siphon". Ancient Greek physician Aretaeus of Cappadocia (fl. 1st century CE) used that word, with the intended meaning "excessive discharge of urine", as the name for the disease. Ultimately, the word comes from Greek διαβαίνειν (diabainein), meaning "to pass through,"  which is composed of δια- (dia-), meaning "through" and βαίνειν (bainein), meaning "to go". The word "diabetes" is first recorded in English, in the form diabete, in a medical text written around 1425. The word mellitus ( /məˈlaɪtəs/ or /ˈmɛlɪtəs/ ) comes from the classical Latin word mellītus, meaning "mellite"  (i.e. sweetened with honey;  honey-sweet  ). The Latin word comes from mell-, which comes from mel, meaning "honey";   sweetness;  pleasant thing,  and the suffix -ītus,  whose meaning is the same as that of the English suffix "-ite". It was Thomas Willis who in 1675 added "mellitus" to the word "diabetes" as a designation for the disease, when he noticed the urine of a diabetic had a sweet taste (glycosuria). This sweet taste had been noticed in urine by the ancient Greeks, Chinese, Egyptians, Indians, and Persians. The 1989 "St. Vincent Declaration"   was the result of international efforts to improve the care accorded to those with diabetes. Doing so is important not only in terms of quality of life and life expectancy but also economically –expenses due to diabetes have been shown to be a major drain on health –and productivity-related resources for healthcare systems and governments. Insulin resistance (IR) is considered as a pathological condition in which cells fail to respond normally to the hormone insulin. To prevent hyperglycemia and noticeable organ damage over time, the body produces insulin when glucose starts to be released into the bloodstream, primarily from the digestion of carbohydrates in the diet. Under normal conditions of insulin reactivity, this insulin response triggers glucose being taken into body cells, to be used for energy, and inhibits the body from using fat for energy, thereby causing the concentration of glucose in the blood to decrease as a result, staying within the normal range even when a large amount of carbohydrates is consumed. Carbohydrates comprise simple sugars, i.e. monosaccharides, such as glucose and fructose, disaccharides, such as cane sugar, and polysaccharides, e.g. starches. Fructose, which is metabolised into triglycerides in the liver, stimulates insulin production through another mechanism, and can have a more potent effect than other carbohydrates. A habitually high intake of carbohydrates, and particularly fructose, e.g. with sweetened beverages, contributes to insulin resistance and has been linked to weight gain and obesity. If excess blood sugar is not sufficiently absorbed by cells even in the presence of insulin, the increase in the level of blood sugar can result in the classic hyperglycemic triad of polyphagia, polydipsia, and polyuria. Avoiding carbohydrates and sugars, a no-carbohydrate diet or fasting can reverse insulin resistance. The following is a glossary of diabetes which explains terms connected with diabetes. Gestational diabetes is a condition in which a woman without diabetes develops high blood sugar levels during pregnancy. Gestational diabetes generally results in few symptoms; however, it does increase the risk of pre-eclampsia, depression, and requiring a Caesarean section. Babies born to mothers with poorly treated gestational diabetes are at increased risk of being too large, having low blood sugar after birth, and jaundice. If untreated, it can also result in a stillbirth. Long term, children are at higher risk of being overweight and developing type 2 diabetes. "Maturity onset diabetes of the young" (MODY) refers to any of several hereditary forms of diabetes mellitus caused by mutations in an autosomal dominant gene disrupting insulin production. MODY is often referred to as "monogenic diabetes" to distinguish it from the more common types of diabetes, which involve more complex combinations of causes involving multiple genes and environmental factors. MODY 2 and MODY 3 are the most common forms. 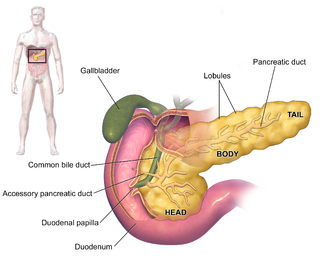 MODY should not be confused with latent autoimmune diabetes of adults (LADA) — a form of type 1 DM, with slower progression to insulin dependence than child-onset type 1 DM, and which occurs later in life. Prediabetes is the precursor stage before diabetes mellitus in which not all of the symptoms required to diagnose diabetes are present, but blood sugar is abnormally high. This stage is often referred to as the "grey area". It is not a disease; the American Diabetes Association says, "Prediabetes should not be viewed as a clinical entity in its own right but rather as an increased risk for diabetes and cardiovascular disease (CVD). Prediabetes is associated with obesity, dyslipidemia with high triglycerides and/or low HDL cholesterol, and hypertension." It is thus a metabolic diathesis or syndrome, and it usually involves no symptoms and only high blood sugar as the sole sign. The complications of diabetes mellitus are far less common and less severe in people who have well-controlled blood sugar levels. Acute complications include hypoglycemia and hyperglycemia, diabetic coma and nonketotic hyperosmolar coma. 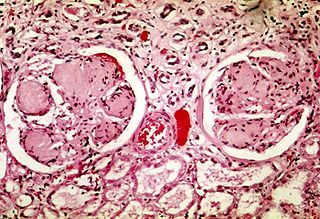 Chronic complications occur due to a mix of microangiopathy, macrovascular disease and immune dysfunction in the form of autoimmune disease or poor immune response, most of which are difficult to manage. Microangiopathy can affect all vital organs, kidneys, heart and brain, as well as eyes, nerves, lungs and locally gums and feet. Macrovascular problems can lead to cardiovascular disease including erectile dysfunction. Female infertility may be due to endocrine dysfunction with impaired signalling on a molecular level. Diabetes usually refers to diabetes mellitus, a group of metabolic diseases in which a person has high blood glucose levels over a prolonged period. A number of lifestyle factors are known to be important to the development of diabetes mellitus type 2 including: obesity, physical activity, diet, stress, and urbanization. Excess body fat underlies 64% of cases of diabetes in men and 77% of cases in women. A number of dietary factors such as sugar sweetened drinks and the type of fat in the diet appear to play a role. Empagliflozin, sold under the trade name Jardiance among others, is a medication used together with diet and exercise to treat type 2 diabetes. It is less preferred than metformin and sulfonylureas. It may be used together with other medications such as metformin or insulin. It is not recommended for type 1 diabetes. It is taken by mouth. SGLT2 inhibitors, also called gliflozins, are a class of medications that inhibit reabsorption of glucose in the kidney and therefore lower blood sugar. They act by inhibiting sodium-glucose transport protein 2 (SGLT2). SGLT2 inhibitors are used in the treatment of type II diabetes mellitus (T2DM). Apart from blood sugar control, gliflozins have been shown to provide significant cardiovascular benefit in T2DM patients. Several medications of this class have been approved or are currently under development. In studies on canagliflozin, a member of this class, the medication was found to enhance blood sugar control as well as reduce body weight and systolic and diastolic blood pressure. 1 2 Kitabchi AE, Umpierrez GE, Miles JM, Fisher JN (July 2009). "Hyperglycemic crises in adult patients with diabetes". Diabetes Care. 32 (7): 1335–43. doi:10.2337/dc09-9032. PMC 2699725 . PMID 19564476. ↑ Chiang, JL; Kirkman, MS; Laffel, LMB; Peters, AL (16 June 2014). "Type 1 Diabetes Through the Life Span: A Position Statement of the American Diabetes Association". Diabetes Care. 37 (7): 2034–54. doi:10.2337/dc14-1140. PMC 5865481 . PMID 24935775. ↑ "Causes of Diabetes". National Institute of Diabetes and Digestive and Kidney Diseases. June 2014. Archived from the original on 2 February 2016. Retrieved 10 February 2016. ↑ Brutsaert, Erika F. (February 2017). "Drug Treatment of Diabetes Mellitus" . Retrieved 12 October 2018. 1 2 3 4 5 6 7 8 9 10 11 12 International Diabetes Federation (2017). IDF Diabetes Atlas, 8th edn. Brussels, Belgium: International Diabetes Federation. 1 2 3 4 5 6 Shoback DG, Gardner D, eds. (2011). "Chapter 17". Greenspan's basic & clinical endocrinology (9th ed.). New York: McGraw-Hill Medical. ISBN 978-0-07-162243-1. ↑ RSSDI textbook of diabetes mellitus (Rev. 2nd ed.). Jaypee Brothers Medical Publishers. 2012. p. 235. ISBN 978-93-5025-489-9. Archived from the original on 14 October 2015. 1 2 "The top 10 causes of death Fact sheet N°310". World Health Organization. October 2013. Archived from the original on 30 May 2017. ↑ Rippe RS, Irwin JM, eds. (2010). Manual of intensive care medicine (5th ed.). Wolters Kluwer Health/Lippincott Williams & Wilkins. p. 549. ISBN 978-0-7817-9992-8. ↑ Cash, Jill (2014). Family Practice Guidelines (3rd ed.). Springer. p. 396. ISBN 978-0-8261-6875-7. Archived from the original on 31 October 2015. 1 2 3 4 Williams textbook of endocrinology (12th ed.). Elsevier/Saunders. 2011. pp. 1371–1435. ISBN 978-1-4377-0324-5. 1 2 Shi Y, Hu FB (June 2014). 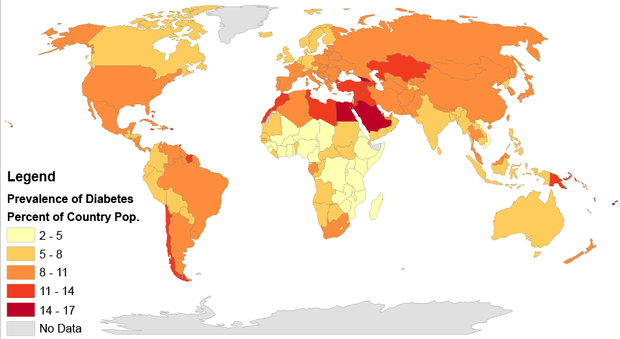 "The global implications of diabetes and cancer". Lancet. 383 (9933): 1947–48. doi:10.1016/S0140-6736(14)60886-2. PMID 24910221. 1 2 3 Vos T, Flaxman AD, Naghavi M, Lozano R, Michaud C, Ezzati M, et al. (December 2012). "Years lived with disability (YLDs) for 1160 sequelae of 289 diseases and injuries 1990–2010: a systematic analysis for the Global Burden of Disease Study 2010". Lancet. 380 (9859): 2163–96. doi:10.1016/S0140-6736(12)61729-2. PMC 6350784 . PMID 23245607. ↑ "Economic costs of diabetes in the U.S. in 2012". Diabetes Care. 36 (4): 1033–46. April 2013. doi:10.2337/dc12-2625. PMC 3609540 . PMID 23468086. ↑ Cooke DW, Plotnick L (November 2008). "Type 1 diabetes mellitus in pediatrics". Pediatrics in Review. 29 (11): 374–84, quiz 385. doi:10.1542/pir.29-11-374. PMID 18977856. ↑ "WHO | Diabetes mellitus". WHO. Retrieved 2019-03-23. ↑ Rockefeller, J.D. (2015). Diabetes: Symptoms, Causes, Treatment and Prevention. ISBN 978-1-5146-0305-5. ↑ Verrotti A, Scaparrotta A, Olivieri C, Chiarelli F (December 2012). 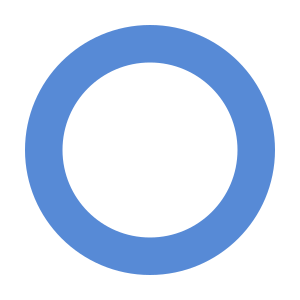 "Seizures and type 1 diabetes mellitus: current state of knowledge". European Journal of Endocrinology. 167 (6): 749–58. doi:10.1530/EJE-12-0699. PMID 22956556. ↑ "Glucagon–Injection side effects, medical uses, and drug interactions". MedicineNet. Retrieved 2018-02-05. 1 2 Kitabchi AE, Umpierrez GE, Miles JM, Fisher JN (July 2009). "Hyperglycemic crises in adult patients with diabetes". Diabetes Care. 32 (7): 1335–43. doi:10.2337/dc09-9032. PMC 2699725 . PMID 19564476. Archived from the original on 2016-06-25. ↑ Sarwar N, Gao P, Seshasai SR, Gobin R, Kaptoge S, Di Angelantonio E, Ingelsson E, Lawlor DA, Selvin E, Stampfer M, Stehouwer CD, Lewington S, Pennells L, Thompson A, Sattar N, White IR, Ray KK, Danesh J (June 2010). "Diabetes mellitus, fasting blood glucose concentration, and risk of vascular disease: a collaborative meta-analysis of 102 prospective studies". Lancet. 375 (9733): 2215–22. doi:10.1016/S0140-6736(10)60484-9. PMC 2904878 . PMID 20609967. ↑ "Diabetes – eye care: MedlinePlus Medical Encyclopedia". medlineplus.gov. Retrieved 2018-03-27. ↑ Cukierman, T (8 Nov 2005). "Cognitive decline and dementia in diabetes – systematic overview of prospective observational studies". Diabetologia. 48 (12): 2460–69. doi:10.1007/s00125-005-0023-4. PMID 16283246. ↑ Yang Y, Hu X, Zhang Q, Zou R (November 2016). "Diabetes mellitus and risk of falls in older adults: a systematic review and meta-analysis". Age and Ageing. 45 (6): 761–67. doi:10.1093/ageing/afw140. PMID 27515679. ↑ Rother KI (April 2007). "Diabetes treatment – bridging the divide". The New England Journal of Medicine. 356 (15): 1499–501. doi:10.1056/NEJMp078030. PMC 4152979 . PMID 17429082. ↑ Dorner M, Pinget M, Brogard JM (May 1977). "[Essential labile diabetes (author's transl)]". MMW, Munchener Medizinische Wochenschrift (in German). 119 (19): 671–74. PMID 406527. 1 2 Petzold A, Solimena M, Knoch KP (October 2015). "Mechanisms of Beta Cell Dysfunction Associated With Viral Infection". Current Diabetes Reports (Review). 15 (10): 73. doi:10.1007/s11892-015-0654-x. PMC 4539350 . PMID 26280364. So far, none of the hypotheses accounting for virus-induced beta cell autoimmunity has been supported by stringent evidence in humans, and the involvement of several mechanisms rather than just one is also plausible. ↑ Butalia S, Kaplan GG, Khokhar B, Rabi DM (December 2016). "Environmental Risk Factors and Type 1 Diabetes: Past, Present, and Future". Canadian Journal of Diabetes (Review). 40 (6): 586–93. doi:10.1016/j.jcjd.2016.05.002. PMID 27545597. ↑ Serena G, Camhi S, Sturgeon C, Yan S, Fasano A (August 2015). "The Role of Gluten in Celiac Disease and Type 1 Diabetes". Nutrients. 7 (9): 7143–62. doi:10.3390/nu7095329. PMC 4586524 . PMID 26343710. ↑ Visser J, Rozing J, Sapone A, Lammers K, Fasano A (May 2009). "Tight junctions, intestinal permeability, and autoimmunity: celiac disease and type 1 diabetes paradigms". Annals of the New York Academy of Sciences. 1165 (1): 195–205. Bibcode:2009NYASA1165..195V. doi:10.1111/j.1749-6632.2009.04037.x. PMC 2886850 . PMID 19538307. 1 2 Risérus U, Willett WC, Hu FB (January 2009). "Dietary fats and prevention of type 2 diabetes". Progress in Lipid Research. 48 (1): 44–51. doi:10.1016/j.plipres.2008.10.002. PMC 2654180 . PMID 19032965. ↑ Malik VS, Popkin BM, Bray GA, Després JP, Hu FB (March 2010). "Sugar-sweetened beverages, obesity, type 2 diabetes mellitus, and cardiovascular disease risk". Circulation. 121 (11): 1356–64. doi:10.1161/CIRCULATIONAHA.109.876185. PMC 2862465 . PMID 20308626. ↑ Malik VS, Popkin BM, Bray GA, Després JP, Willett WC, Hu FB (November 2010). "Sugar-sweetened beverages and risk of metabolic syndrome and type 2 diabetes: a meta-analysis". Diabetes Care. 33 (11): 2477–83. doi:10.2337/dc10-1079. PMC 2963518 . PMID 20693348. ↑ Hu EA, Pan A, Malik V, Sun Q (March 2012). "White rice consumption and risk of type 2 diabetes: meta-analysis and systematic review". BMJ. 344: e1454. doi:10.1136/bmj.e1454. PMC 3307808 . PMID 22422870. ↑ National Collaborating Centre for Women's and Children's Health (February 2015). "Intrapartum care". Diabetes in Pregnancy: Management of diabetes and its complications from preconception to the postnatal period. National Institute for Health and Care Excellence (UK). 1 2 "Definition, Diagnosis and Classification of Diabetes Mellitus and its Complications" (PDF). World Health Organization. 1999. Archived (PDF) from the original on 2003-03-08. ↑ de la Monte SM (December 2014). "Type 3 diabetes is sporadic Alzheimer׳s disease: mini-review". European Neuropsychopharmacology. 24 (12): 1954–60. doi:10.1016/j.euroneuro.2014.06.008. PMC 4444430 . PMID 25088942. ↑ Unless otherwise specified, reference is: Table 20-5 in Mitchell, Richard Sheppard; Kumar, Vinay; Abbas, Abul K.; Fausto, Nelson (2007). Robbins Basic Pathology (8th ed.). Philadelphia: Saunders. ISBN 978-1-4160-2973-1. ↑ Ahlqvist, Emma; Storm, Petter; Käräjämäki, Annemari; Martinell, Mats; Dorkhan, Mozhgan; Carlsson, Annelie; Vikman, Petter; Prasad, Rashmi B; Aly, Dina Mansour (2018). "Novel subgroups of adult-onset diabetes and their association with outcomes: a data-driven cluster analysis of six variables". The Lancet Diabetes & Endocrinology. 0 (5): 361–69. doi:10.1016/S2213-8587(18)30051-2. ISSN 2213-8587. PMID 29503172. 1 2 3 4 Shoback DG, Gardner D, eds. (2011). Greenspan's basic & clinical endocrinology (9th ed.). McGraw-Hill Medical. ISBN 978-0-07-162243-1. ↑ Barrett KE, et al. (2012). Ganong's review of medical physiology (24th ed.). McGraw-Hill Medical. ISBN 978-0-07-178003-2. ↑ Murray RK, et al. (2012). Harper's illustrated biochemistry (29th ed.). McGraw-Hill Medical. ISBN 978-0-07-176576-3. ↑ Mogotlane, Sophie (2013). Juta's Complete Textbook of Medical Surgical Nursing. Cape Town: Juta. p. 839. ↑ Vijan, S (March 2010). "Type 2 diabetes". Annals of Internal Medicine . 152 (5): ITC31-15. doi:10.7326/0003-4819-152-5-201003020-01003. PMID 20194231. ↑ ""Diabetes Care" January 2010". Diabetes Care. 33: S3. 2009. doi:10.2337/dc10-S003. PMC 2797388 . PMID 20042773. Archived from the original on 13 January 2010. Retrieved 29 January 2010. ↑ Selvin E, Steffes MW, Zhu H, Matsushita K, Wagenknecht L, Pankow J, Coresh J, Brancati FL (March 2010). "Glycated hemoglobin, diabetes, and cardiovascular risk in nondiabetic adults". The New England Journal of Medicine. 362 (9): 800–11. CiteSeerX 10.1.1.589.1658 . doi:10.1056/NEJMoa0908359. PMC 2872990 . PMID 20200384. ↑ Kyu HH, Bachman VF, Alexander LT, Mumford JE, Afshin A, Estep K, Veerman JL, Delwiche K, Iannarone ML, Moyer ML, Cercy K, Vos T, Murray CJ, Forouzanfar MH (August 2016). "Physical activity and risk of breast cancer, colon cancer, diabetes, ischemic heart disease, and ischemic stroke events: systematic review and dose-response meta-analysis for the Global Burden of Disease Study 2013". BMJ. 354: i3857. doi:10.1136/bmj.i3857. PMC 4979358 . PMID 27510511. 1 2 "The Nutrition Source". Harvard School of Public Health. 2012-09-18. Archived from the original on 25 April 2014. Retrieved 24 April 2014. ↑ "Chronic diseases and their common risk factors" (PDF). World Health Organization. 2005. Archived (PDF) from the original on 2016-10-17. Retrieved 30 August 2016. ↑ "No cure for diabetes". WebMD. Archived from the original on 2015-05-21. Retrieved 21 May 2015. ↑ Nathan DM, Cleary PA, Backlund JY, Genuth SM, Lachin JM, Orchard TJ, Raskin P, Zinman B (December 2005). "Intensive diabetes treatment and cardiovascular disease in patients with type 1 diabetes". The New England Journal of Medicine. 353 (25): 2643–53. doi:10.1056/NEJMoa052187. PMC 2637991 . PMID 16371630. ↑ "The effect of intensive diabetes therapy on the development and progression of neuropathy. The Diabetes Control and Complications Trial Research Group". Annals of Internal Medicine. 122 (8): 561–68. April 1995. doi:10.7326/0003-4819-122-8-199504150-00001. PMID 7887548. 1 2 National Institute for Health and Clinical Excellence . Clinical guideline 66: Type 2 diabetes . London, 2008. ↑ Cavanagh PR (2004). "Therapeutic footwear for people with diabetes". Diabetes/Metabolism Research and Reviews. 20 Suppl 1 (Suppl 1): S51–55. doi:10.1002/dmrr.435. PMID 15150815. ↑ Haw JS, Galaviz KI, Straus AN, Kowalski AJ, Magee MJ, Weber MB, Wei J, Narayan KM, Ali MK (December 2017). "Long-term Sustainability of Diabetes Prevention Approaches: A Systematic Review and Meta-analysis of Randomized Clinical Trials". JAMA Internal Medicine. 177 (12): 1808–17. doi:10.1001/jamainternmed.2017.6040. PMC 5820728 . PMID 29114778. ↑ Mottalib A, Kasetty M, Mar JY, Elseaidy T, Ashrafzadeh S, Hamdy O (August 2017). "Weight Management in Patients with Type 1 Diabetes and Obesity". Current Diabetes Reports. 17 (10): 92. doi:10.1007/s11892-017-0918-8. PMC 5569154 . PMID 28836234. ↑ Emadian A, Andrews RC, England CY, Wallace V, Thompson JL (November 2015). "The effect of macronutrients on glycaemic control: a systematic review of dietary randomised controlled trials in overweight and obese adults with type 2 diabetes in which there was no difference in weight loss between treatment groups". The British Journal of Nutrition. 114 (10): 1656–66. doi:10.1017/S0007114515003475. PMC 4657029 . PMID 26411958. ↑ MacIsaac, RJ; Jerums, G; Ekinci, EI (March 2018). "Glycemic Control as Primary Prevention for Diabetic Kidney Disease". Advances in Chronic Kidney Disease. 25 (2): 141–48. doi:10.1053/j.ackd.2017.11.003. PMID 29580578. 1 2 3 Pozzilli, P; Strollo, R; Bonora, E (23 March 2014). "One size does not fit all glycemic targets for type 2 diabetes". Journal of Diabetes Investigation. 5 (2): 134–41. doi:10.1111/jdi.12206. PMC 4023573 . PMID 24843750. ↑ Arguedas JA, Perez MI, Wright JM (July 2009). Arguedas JA (ed.). "Treatment blood pressure targets for hypertension". The Cochrane Database of Systematic Reviews (3): CD004349. doi:10.1002/14651858.CD004349.pub2. PMID 19588353. ↑ Brunström M, Carlberg B (February 2016). "Effect of antihypertensive treatment at different blood pressure levels in patients with diabetes mellitus: systematic review and meta-analyses". BMJ. 352: i717. doi:10.1136/bmj.i717. PMC 4770818 . PMID 26920333. ↑ Pignone M, Alberts MJ, Colwell JA, Cushman M, Inzucchi SE, Mukherjee D, Rosenson RS, Williams CD, Wilson PW, Kirkman MS (June 2010). "Aspirin for primary prevention of cardiovascular events in people with diabetes: a position statement of the American Diabetes Association, a scientific statement of the American Heart Association, and an expert consensus document of the American College of Cardiology Foundation". Diabetes Care. 33 (6): 1395–402. doi:10.2337/dc10-0555. PMC 2875463 . PMID 20508233. 1 2 3 4 5 6 "Global Report on Diabetes" (PDF). World Health Organization. 2016. Retrieved 20 September 2018. ↑ Mathers CD, Loncar D (November 2006). "Projections of global mortality and burden of disease from 2002 to 2030". PLoS Medicine. 3 (11): e442. doi:10.1371/journal.pmed.0030442. PMC 1664601 . PMID 17132052. 1 2 3 4 5 6 7 8 9 Poretsky, Leonid, ed. (2009). Principles of diabetes mellitus (2nd ed.). New York: Springer. p. 3. ISBN 978-0-387-09840-1. Archived from the original on 2016-04-04. 1 2 Roberts, Jacob (2015). "Sickening sweet". Distillations. Vol. 1 no. 4. pp. 12–15. Retrieved 20 March 2018. 1 2 Laios K, Karamanou M, Saridaki Z, Androutsos G (2012). "Aretaeus of Cappadocia and the first description of diabetes" (PDF). Hormones. 11 (1): 109–13. doi:10.1007/BF03401545. PMID 22450352. Archived (PDF) from the original on 2017-01-04. ↑ Theodore H. Tulchinsky, Elena A. Varavikova (2008). The New Public Health, Second Edition. New York: Academic Press. p. 200. ISBN 978-0-12-370890-8. ↑ Piwernetz K, Home PD, Snorgaard O, Antsiferov M, Staehr-Johansen K, Krans M (May 1993). "Monitoring the targets of the St Vincent Declaration and the implementation of quality management in diabetes care: the DIABCARE initiative. The DIABCARE Monitoring Group of the St Vincent Declaration Steering Committee". Diabetic Medicine. 10 (4): 371–77. doi:10.1111/j.1464-5491.1993.tb00083.x. PMID 8508624. ↑ Stewart WF, Ricci JA, Chee E, Hirsch AG, Brandenburg NA (June 2007). "Lost productive time and costs due to diabetes and diabetic neuropathic pain in the US workforce". Journal of Occupational and Environmental Medicine. 49 (6): 672–79. doi:10.1097/JOM.0b013e318065b83a. PMID 17563611. ↑ Parker, Katrina (2008). Living with diabetes. New York: Facts On File. p. 143. ISBN 978-1-4381-2108-6. Archived from the original on 2017-09-06. 1 2 Maria Rotella C, Pala L, Mannucci E (Summer 2013). "Role of insulin in the type 2 diabetes therapy: past, present and future". International Journal of Endocrinology and Metabolism. 11 (3): 137–44. doi:10.5812/ijem.7551. PMC 3860110 . PMID 24348585. ↑ "Press Announcement". Journal of Polymer Science B Polymer Physics. 8 (10): 1845. 1970. Bibcode:1970JPoSB...8.1845.. doi:10.1002/pol.1970.160081020. Archived from the original on 3 March 2016. Retrieved 11 February 2016. ↑ The Diabetes Control; Complications Trial Research Group. (1993). "The effect of intensive treatment of diabetes on the development and progression of long-term complications in insulin-dependent diabetes mellitus". N Engl J Med. 329 (14): 977–86. doi:10.1056/NEJM199309303291401. PMID 8366922.